These are wet, soft, towelettes in a resealable package. Simple to use, you just remove from package and gently cleanse your face. I used them for a couple weeks so I could give a thorough opinion. I wanted to make sure they wouldn’t irritate my skin over time, and I wanted to test them in a couple ways. First of all, I dislike washing my face. I’m not sure what it is…maybe the water dripping down to my elbows, my hair always seeming to get wet no matter how I pull it back, soap/water getting in my eyes/up my nose…I just don’t like it. 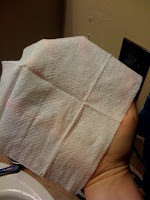 So, for me to have these nifty towelettes that gently yet thoroughly clean without leaving any residue behind? Fantastic. I may start wearing make-up more often. Since they say they leave no residue, I tried ‘washing’ my face with them without rinsing. My skin felt clean and fresh. I did not notice any mascara or other make-up remnants. I felt comfortable going to bed without rinsing. Upon waking in the morning, I did not find any mascara flakes or make-up on my pillow or face. The next night, I used the towelettes as before, but rinsed my face. After rinsing, I noticed a little mascara under my eyes. I’m not sure if this was because I didn’t wash good enough or what, but I would recommend rinsing if your skin is sensitive to make-up or cleansers. I probably won’t rinse because my skin is not very sensitive, plus the whole water dripping/elbow/eyes/nose issues I have. Overall, I was very pleased with the quality and effectiveness of the towelettes. My face felt clean and soft after using, I had no skin irritations, and they removed much more make-up than what I was previously using. I plan on continuing to use these cloths as part of my regular routine. 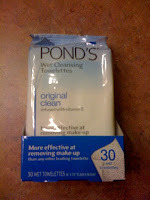 Be sure to check out www.ponds.lifestyle.msn.com. The Pond’s MSN site has tons of useful information regarding the towelettes. It is organized in a very user-friendly way…enough that I decided against attempting to go into too much detail. There are study results, video, tips, and a moneyback guarantee! Okay, on to the GIVEAWAY! Up for grabs is a package of Pond’s Cleansing Towelettes – Original Clean. This giveaway will run from Aug. 28, 2009 – Sept. 12, 2009. I will draw at NOON on Saturday, Sept. 12, and will contact the winner via e-mail. If winner does not respond with shipping address within 48 hours, a new winner will be drawn. Good Luck! Spread the word about this giveaway…more entrants = more giveaways in the future!